Darn you withholding the tissues. Darn you, I say! It's a beautiful book, both in text and in pictures. The collaboration of McGhee and Reynolds = SO GOOD. Have you read any of her novels? 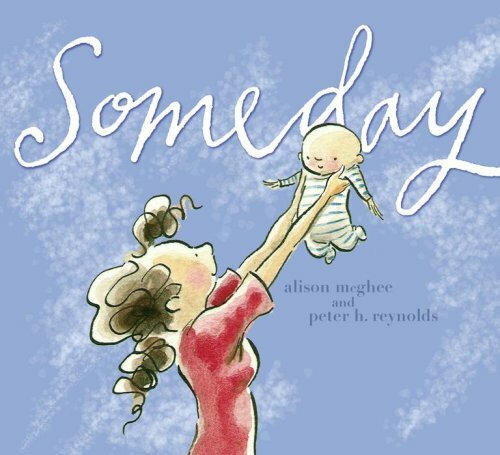 I have enjoyed every single Alison McGhee I've read - Countdown to Kindergarten (PB), Shadow Baby (Fic/Lit), Snap (Juvie/Teen), All Rivers Flow to the Sea (Teen), A Very Brave Witch (PB - Holiday), and Someday (you are here!) - and I have been waiting for Falling Boy to come in for me at the library for a month. If Snap is good, then Sea is great, and Shadow Baby is grand. I feel the same way about the "bound Hallmark card" aspect. I see so many crappy manuscripts that are really love poems to the author's kids, and I always reject them with some line like, "the perspective seems more adult than kid." Then something like this comes along -- something that, despite its heavy schlock potential, is actually quite nicely written -- and sells a billion copies and gives all the grandma-trap writers unwarranted confidence. That said, I don't think it would work at all without Reynolds's art.